As you already know, since this Friday all the kids will stop their lessons ¡The Holy Week is here! And what it is about? Well, depending on the country where is celebrated, this week has more or less religious connotations and more or less importance. In this post we wanted to show you the differences between the one that takes place in the United Kingdom and the one that takes place in Spain. Spanish Holy Week is celebrated with famous processions, which are manifestations of faith by the faithful, organized normally by brotherhoods. These brotherhoods carry over their shoulders different religious images, also called in Spanish “pasos”, related to the Passion of the Christ. This tradition has been consolidated over the years, but its beginnings go back to 1547 when the Tarifa marquis returned to Spain from the Holy Land. Since then, he established the “Via Crucis in Spain”, making it one of the most important events in the country. The most characteristic feature of these processions are the penitents, who are faithful with conical hats called “capirotes” and, despite this hats resemble the hoods of the Ku-Klux-Klan members, they have nothing to do with them. In addition, another curiosity to take into account is that, during the Spanish Holy Week Spaniards decorate and eat chocolate eggs called “La mona de pascua”. Finally, as an interesting fact for those who do not know nothing about the Spanish Holy Week, during 40 days since the Holy Week begins, any faithful can eat meat on Fridays, they are called Lent Fridays. English Easter is called Easter Week. The first curiosity of this English festival is its name. While in the Spanish case the name is totally related with religion, in England the name comes from the Anglo-Saxon word “Eostre” which means April, the month when it is celebrated. Within this week there are two more important days: Good Friday and Easter Sunday. During the Good Friday, English people eat for breakfast buns with raisins and a cream cross. These buns are made to remember Jesus and are called Hot Cross Buns. The Easter Sunday, which can be considered as the day with more relevance of the whole week. It is important not only due to different religious events such as the Eucharist Easter which take place in many English churches in order to remember the death and resurrection of Jesus, where British citizens come and light an Easter candle, but also because is the day of the famous Easter eggs or chocolate eggs. When we think about Easter eggs, we imagine the typical chocolate eggs decorated with thousand colours and a basket carried by a rabbit. But how did this tradition arose? Anglo-Saxon legend states that, when Jesus died, was buried in a cave in which lived a rabbit. This rabbit saw all the faithful crying and, when the cave was sealed, witnessed Jesus resurrection. At that time, he realized what was happening and, as he wanted to convey the good news, but he could not speak, he took some colored eggs and left them in front of all the houses to convey the message of happiness for the resurrection. Since then, it is believed that the rabbit goes every year to different houses, hiding colored eggs for the kids. In addition to eat cooked eggs and exchange of the decorated eggs, during that day is celebrated the traditional Egg Roll, which consists of throwing eggs decorated down a hill. The winner is the one whose egg comes down without breaking. ¿And why you don’t travel with MyHostpitality? After all you have read, why you don’t take the advantage of enjoy Easter in another country in an affordable way? 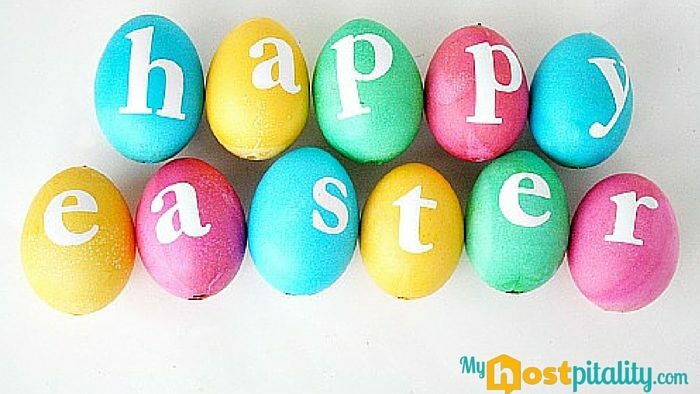 With MyHostpitality you have the opportunity to do so! Register in our on-line platform, contact with different hosts that live in the country where you want to travel and set with them the dates! By this way you will have the opportunity to fully experience the culture of the country, come into direct contact with natives and besides, enjoy Easter surrounded by people who will teach the country’s traditions. All you have to do is spend some time during the day to teach your language to your host. Register soon and know other cultures with us!